Grundfos and the IBU Meet Up at the ISH | Institut Bauen und Umwelt e.V. It was only recently that Denmark’s Grundfos Corporation became a member of the Institut Bauen und Umwelt e.V. (IBU). 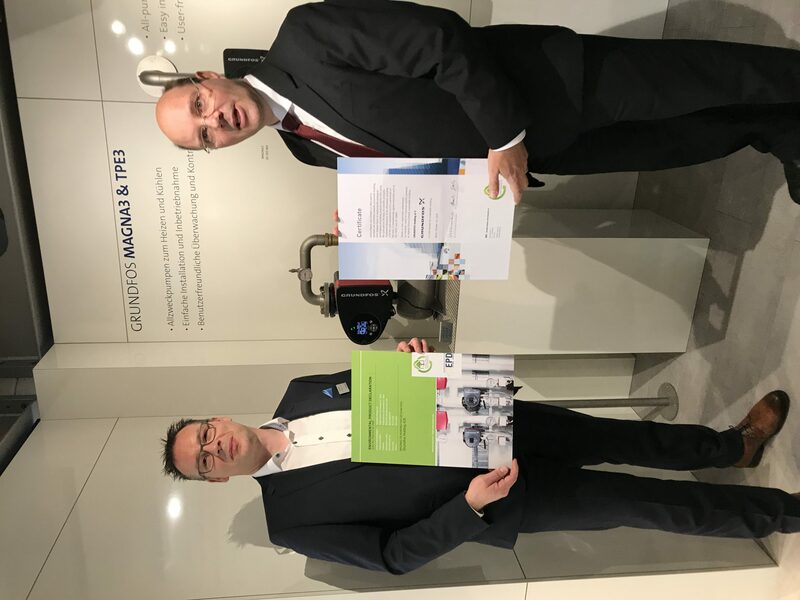 At the ISH in Frankfurt, IBU Managing Director Dr Alexander Röder presented Ingo Landwehr, Director Marketing und Business Development of Grundfos for the D-A-CH Area, with the company’s first environmental product declaration. ISH is the world’s foremost trade fair for the promotion of responsible water and energy consumption in buildings – it was therefore the ideal venue for the official presentation of Grundfos’ environmental product declaration (EPD). “We are particularly pleased that Grundfos, an internationally-renowned manufacturer of technical building equipment, has joined the ranks of our membership”, related Alexander Röder, IBU Managing Director. “Technical building equipment has an enormous influence on a building’s environmental impact, especially during the use phase. However, we are still seeing far too little life cycle assessment data from this area”. With the aid of EPDs, Grundfos plans to make the environmental impact of this type of equipment more transparent. Grundfos is a world leader in the development and manufacture of energy-efficient and sustainable pump solutions. “Our built-in electronics transform our pumps into smart, demand-driven systems that can significantly reduce water and energy consumption”, explained Ingo Landwehr, Direktor Marketing und Business Development von Grundfos for the D-A-CH Area. “It is very important to us that we are able to transparently document the performance of our products – and EPDs are perfect for this”. 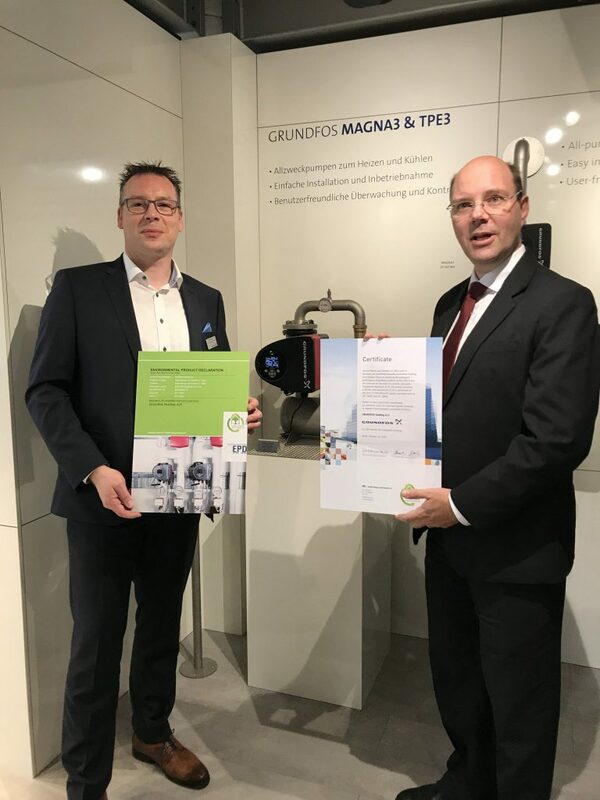 “MAGNA3 is only the first of many products for which we will be creating EPDs”, adds Dirk Schmitz, Head of Communication and PR at Grundfos for the D-A-CH Area. “As a company, we have always been committed to sustainability. Life cycle assessment data is invaluable to our product development – and when it is documented in EPDs, it lends visibility to our efforts and achievements”. EPDs contain comprehensive, standardised information and data regarding a product’s life cycle. Before an EPD can published as part of the IBU’s programme, this data must be verified by independent experts. It is then made available to the public, and can be used, for instance, in building planning and sustainability assessments. The EPD for the MAGNA3 circulation pump is the first declaration for pumps to be published by the IBU, opening up an entirely new product group for the organisation.